Back when Fr. George Elliot was in seminary, he ran into a dilemma. Thanks to a very understanding bishop, he started exploring religious orders and looking for literature to help him discern his vocation. 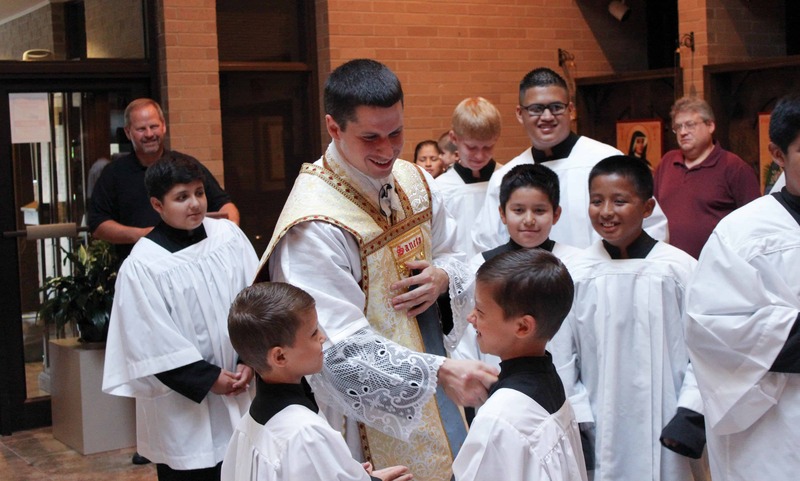 Eventually, he discerned he was where he was supposed to be—right where he started, in formation for diocesan priesthood. But his detour revealed something important. That’s what started him on the path to writing Discernment Do’s and Don’ts: A Practical Guide to Vocational Discernment. He certainly had a lot of experience to draw from. Ever since seminary, he had been communicating with young people via the Catholic Bytes podcast, which he co-founded. Then, just a few years after ordination, he began serving as campus minister at Stephen F. Austin College in Texas. Through countless spiritual direction sessions, Fr. Elliot started seeing a lot of similarities in the young men and women he was serving. The first was that the people striving for holiness always seemed to have a much easier time hearing God’s call. The second was that discernment isn’t just spiritual, or internal. It involves the tangible, too. Fr. Elliot learned a lot from his own vocational discernment. He spent most of his formative years not thinking much about God. He wanted to excel in school, get a good job, get married, have kids, and live happily ever after, and he figured he’d deal with God on his deathbed. Early in high school, that changed. His cousin, who was around his age, was killed in a car crash. This forced him to start thinking about the present, and stop spending all his energy looking toward a future that wasn’t guaranteed. Fortunately during this time, he befriended a new priest in his parish, Fr. Morgan White, through whom he became intellectually convinced in the truth of the Gospel and of the Catholic Faith. The parish, Our Lady of Victory in Paris, Texas, offered perpetual Adoration, and his family was responsible for having someone there during a six-hour block, so he spent a lot of time alone with the Blessed Sacrament. After high school, he enlisted in the Air Force, and his rich prayer life continued. It was there he first heard the call to the priesthood. 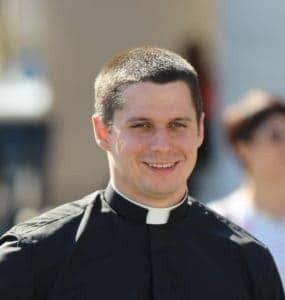 “I was at Mass, and I was praying, ‘Lord, I’ll do anything You ask.’ I was thinking of something along the lines of starting a bible study, or praying the rosary more regularly,” Fr. Elliot laughed. “But it became exceedingly clear: become a priest. It took me a while to accept that. So he decided to write one. 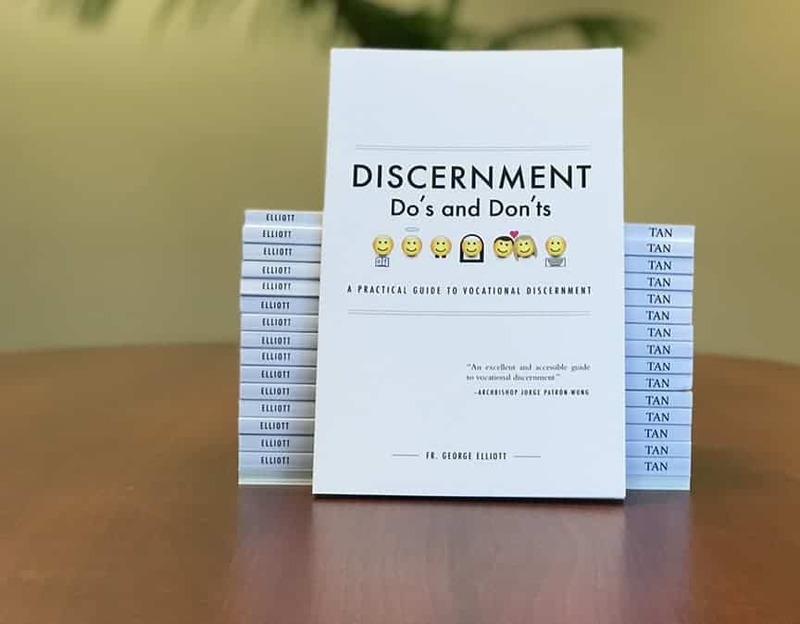 Discernment Do’s and Don’ts lays out a clear path and helps young people identify anything that may be interfering with the discernment process, then suggests ways to overcome those obstacles.